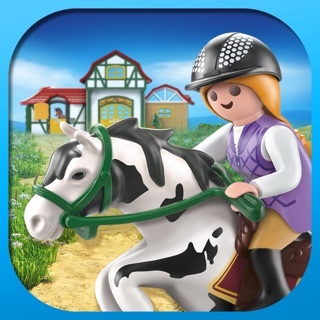 Let yourself be enchanted by Horse Farm – a delightful horse game for equestrian enthusiasts on the go! Build your own horse ranch, keep beautiful horses, pamper your hooved pals and give your guests a vacation they won't forget! Build stables, barns and lodges. Complete riveting horse game tasks, and pamper your Horse Farm's guests with culinary delicacies and a wide variety of horse-related leisure activities. You'll be able to keep all sorts of different horses, from Appaloosas and Quarter Horses to Shetland Ponies, Arabians, Hanoverian and many, many more. Crossbreed different breeds, and get foals that inherit special abilities and appearances from their parents. • Detailed customization options for your horse stable – many things down to the fences, window frames and roof tiles can be painted in your favorite colors! • Diverse management tasks – Supply your horses with water and hay, exercise and train your animals, and cook meals for your guests. You can also hire helpful staff to assist you! 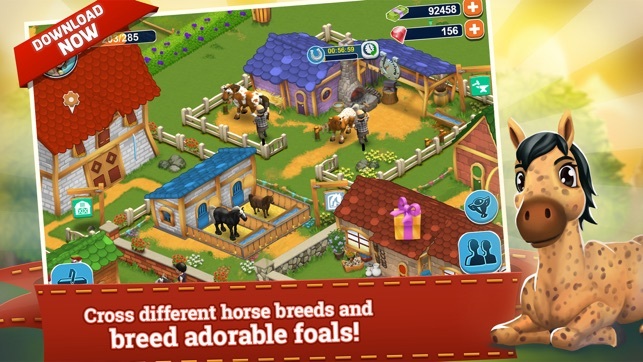 Discover the enchanting world of Horse Farm, a unique horse app distinguished by its attention to detail. 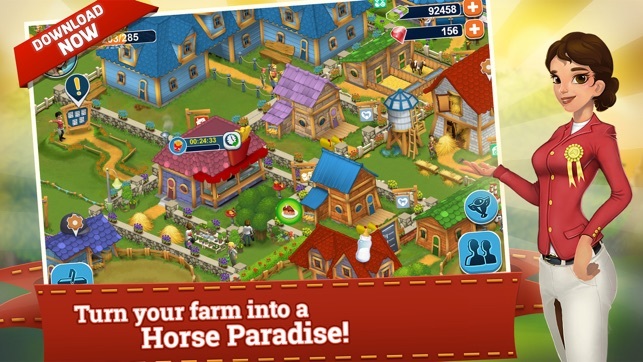 Build a heavenly haven for horses and horse lovers alike, and manage your Horse Farm with care and diligence. Experience how enchanting a horse app can be! 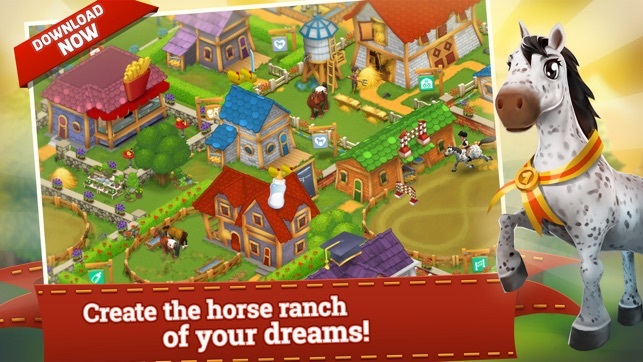 Get Horses for your very own Ranch! Download the app in the store now and take care of your horses! The Easter event is just around the corner! On April 18, you can look forward to an "Eggsquisite Easter". Once again, you'll find balloons filled with colorful feathers all over your ranch. Collect as many as you can to earn delightful prizes, including an Easter Horse, a chicken coop decorations, and an "Eggsquisite Easter" bridle! 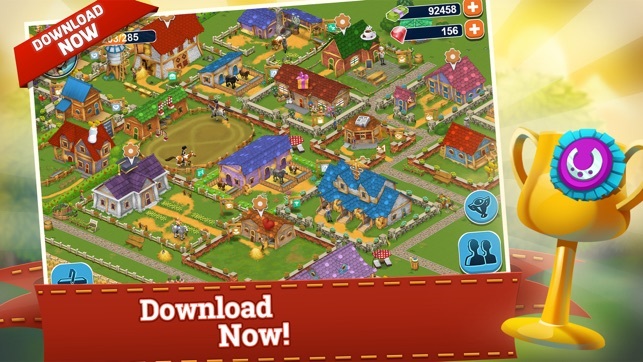 Download the update now and join in the Easter fun in Horse Farm! I took a star off of the five because it is a really good app but there are things I could do without. Such as it being so expensive to breed horses. I've had more fun with games where you don't pay currency at all for breeding. In fact it could earn you in game money if it didn't cost so much. And I gave up because it's hard to fill requests from horses or people when they want things you aren't able to give. Like use of a building you don't yet have built or an item that is part of a building upgrade you can't afford. I couldn't take the pickiness when I was unable to provide that stuff. It should be requests only for things you have already built and not things you have to wait some levels before you can even have them. All I wanted was a horse breeder game that allows some small ease of gameplay even with challenges, such as breeding the horses for little to no in game money. Especially if that's money you can only earn from infrequent guests asking for things you can't give them. Please change this. Thanks. A very fun and entertaining game to play that definitely takes time to progress. I played this game for several hours and was able to get to level 14, I think this game is a blast minus the flaws. The app has problems when using the breeding station and jump course, it’s difficult to interact with. As with most free-to-play games, this app operates with a pay to win system, but there are ways to get around it as long as your conservative with what you spend rubies on. Horse breeding and purchasing gets expensive the higher your level, recommend getting your cash quickly and don’t wait till your further in the game to purchase your breeding horses. Aside from the multiple flaws, a very fun and entertaining game to play that will keep you busy. 1) Rate of cost vs rate of earning is way off. You will not be able to make enough to buy what you need to continue game play. 2) For what you are paying for the horses, they should not age out and retire. Especially since you aren’t able to level them up quickly to complete tasks and use them for tasks to make money. On top of that, some of them cost gems, gems that you either spend forever earning or buy, only to lose the horse? Yeah, no thanks! 3) Extremely picky guests/horse tasks, which would be fine if it was limited to what you had, not giving you unfulfillable tasks. 4) You’re not really interacting with the horses, or able to get them quickly. Prices are high, breeding is high priced, and in order to get more you have to basically buy gems. Game is unplayable unless you want to pour lots of $ into it. Find something else to play.